If you're having a bad day a simple act of kindness can make all the difference in the world. 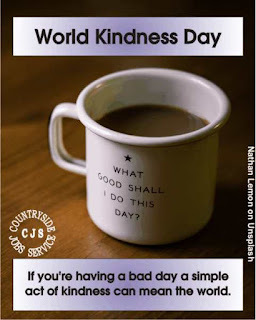 World Kindness Day is celebrated annually on 13th November. On this day, participants attempt to make the world a better place by celebrating and promoting good deeds and pledging acts of kindness, either as individuals or as organisations. In the UK it's recognised day for the celebration of kindness in society and day to day life. Individual acts of kindness are encouraged on this day annually. The organisation has a huge range of suggestions of how to be kind, from building a hedgehog house to volunteering your time and easy to achieve things like harvesting rainwater or filling your bird feeders. And of course ordinary day to day thing's that we often forget in our rush to get somewhere, saying thank you, smiling at people, pausing to help someone with heavy bags, pushchair or wheelchair through doorways.